Issue: Desired two new fly ash silos for bulk storage. Two fly ash storage silos during the construction process. 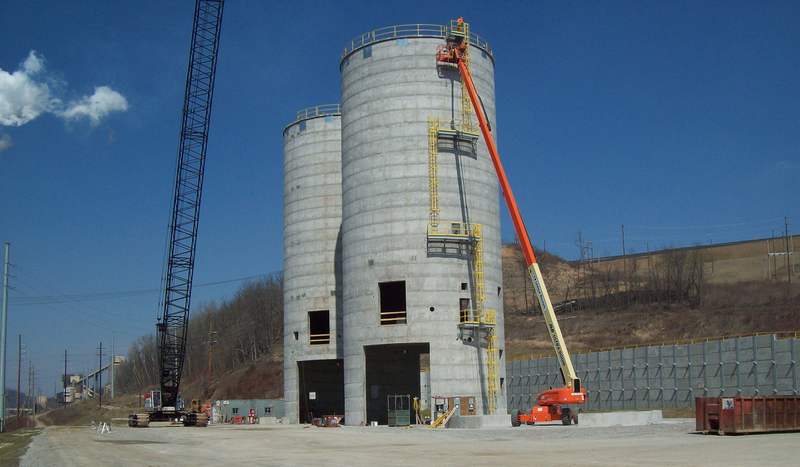 Pictured above are two fly ash storage silos during the construction process. The silos are structurally completed: walls, large truck door openings, equipment floor openings, roof with handrail around the perimeter and access ladders with platforms to the roof. To the left of the silos is the crane that is still onsite. Marietta Silos uses the crane during the construction process to lift structural steel, embeds and penetrations up onto the work deck where it can be easily accessed by the construction crew. The crane is also utilized for lifting a concrete bucket during wall construction. The concrete is poured into the forms in a circular pattern until the 4' forms are filled for that particular jump.